The Terror Trap: What Ever Happened to Aunt Alice? If What Ever Happened to Baby Jane? starred two of the biggest female stars of all time (Bette Davis and Joan Crawford), Whatever Happened To Aunt Alice? had as its two leads, arguably two of the silver screen's greatest character actresses. 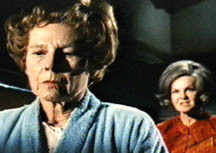 Geraldine Page and Ruth Gordon chew up the scenery in this ghoulish Grand Guignol tale. Page, a notable disciple of the Actors Studio in New York, had been known primarily for her work on the stage - although she had made successful forays in film, most notably with Sweet Bird of Youth. 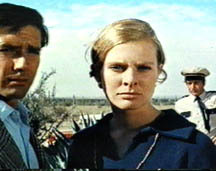 Gordon had been acting and writing screenplays for decades...before finally becoming a movie star and winning an Oscar for Rosemary's Baby, at the youthful age of 72! Robert Aldrich, who directed Baby Jane, produced this one and left the directing chore to Lee H. Katzin. The screenplay was written by Theodore Apstein and based on the novel "The Forbidden Garden" by Ursula Curtiss. 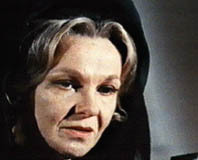 Claire Marrable (Geraldine Page) has just been widowed. 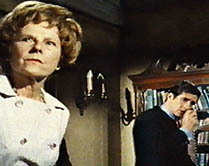 She attends her husband Joseph's funeral and then meets with her lawyer, Mr. Bentley (Peter Bonerz), for the reading of the will. Over tea in her parlor, she is stunned to find out her husband wasn't as solvent as she thought. In fact, Mrs. Marrable is told that there are no assets - only liabilities. What's left are some personal items, including a "rusty dagger," a stamp collection and a boyhood butterfly collection belonging to the deceased. Mrs. Marrable is devastated and says she doesn't know what she's going to do. "You must have relatives," Mr. Bentley tells her. She responds that she has a nephew in Arizona or New Mexico - but she hasn't seen him since he was a child. 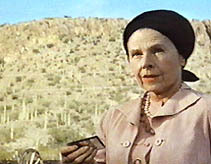 Relocating to Tuscon, Mrs. Marrable hires a housekeeper. One evening, the two women go out into the garden to plant a pine tree. Mrs. Marrable deliberately drops something...and when the domestic bends down to pick it up, she knocks her on the head with a rock. The woman falls into the ditch and Mrs. Marrable buries her and plants the tree in the spot. A succession of housekeepers is hired but they too disappear...as Mrs. Marrable's garden flourishes. 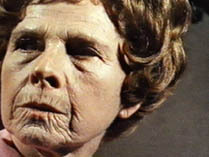 Edna Tinsley (Mildred Dunnock) is brought on and her employer treats her horribly. One day, Juan (Martin Garralaga) the gardener - is instructed to dig a deep hole for a tree that is to be planted in the evening. After Miss Tinsley pours her boss a drink and lights her cigarette, she asks about her stocks...which Mrs. Marrable had her broker supposedly invest in. "He has more pressing business than to render daily quotations of your gigantic investment," is the curt response. The savings were all Miss Tinsley had - and Mrs. Marrable threatens to call the broker and instruct him to sell the stocks "at a loss, if need be." The old woman pleads with her not to do that and says she's going to her room. But Mrs. Marrable has other plans. She reminds Miss Tinsley that she is supposed to help her plant a pine tree. Mrs. Marrable drops her watch in the ditch and Miss Tinsley steps down to retrieve it. Mrs. Marrable then picks up a shovel and hits her employee on her head, before destroying all of the housekeeper's possessions in the fireplace. The one thing she can't bring herself to get rid of is a Bible...choosing instead to rip out the first page with Edna Tinsley's name inscribed. Soon after (and wheelchair bound), Mrs. Marrable attends a party at the home of her nephew George Lawson (Peter Brandon) and his wife Julia (Joan Huntington). Julia tells her friends that their Aunt Claire has moved to Arizona so they can keep an eye on her because "she's got so much money." While Julia flirts with a guest, George chats with Harriet Vaughn (Rosemary Forsyth)...a new resident in town. Harriet has recently lost her husband, a stockbroker back east. She declines George's advances just as Julia and Mrs. Marrable enter the room. Harriet and Mrs. Marrable are introduced to each other. Taking note of Aunt Claire's inability to maintain her housekeepers...Julia tells her husband's relative that it's a pity she had to "fire" Miss Tinsley. The reason given is that the old woman had a drinking problem! A new person arrives at Mrs. Marrable's house to apply for the position. 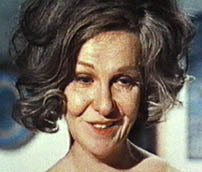 Alice Dimmock (Ruth Gordon) is a former nurse - and also widowed. Mrs. Dimmock's enthusiasm wins over her prospective employer...who is also titillated by the fact that she has her own savings. She gets the job and starts immediately. One afternoon, while looking for a pamphlet on deep-rooting, Mrs. Dimmock comes across Edna's Bible. She notices that the first page has been torn out and is visibly upset. Julia has lunch with Harriet at an upscale restaurant. A guy named Mike Darrah (Robert Fuller) comes over to their table and introduces himself. Julia is smitten with him but he seems more interested in Harriet. Mrs. Marrable relaxes in the parlor and tells Mrs. Dimmock she has to call her broker in Chicago to discuss her investments. Her rest is interrupted by the sound of a barking dog. Chloe is a local stray and Mrs. Marrable makes certain to keep her out of the garden - for obvious reasons. A little boy runs out to protect the dog and it turns out to be Harriet's nephew Jim (Michael Barbera), whom she's taking care of. Harriet has rented the cottage next door, a fact which irks Mrs. Marrable. The place belonged to a former housekeeper of Mrs. Marrable and she calls George to find out why it's been rented out. Her nephew says she had a chance to take it over when the previous tenant stopped making payments. Harriet watches from her window as Mrs. Dimmock puts something in her mailbox for pickup. It's a postcard...and the excuse she gives Harriet is that she's entering the same contest as Mrs. Marrable and wanted to mail it from a different box. Her boss catches them talking and is far from happy. The mailman arrives and Mrs. Dimmock collects the mail. Included is a letter to Edna from a friend named "Al." Seeing the letter rattles Mrs. Marrable. Mike and Harriet spend the day together. She thanks him for telling her about the cottage and their relationship blossoms. Once again, Mrs. Marrable finds Chloe near her garden. She lures the dog into a shack with a piece of meat and tries to kill her. But the dog is too smart and gets the upper hand. For once, Mrs. Marrable leaves defeated. That evening, Mrs. Dimmock prepares dinner for her impatient boss. She talks back to her and Mrs. Marrable says she is tempted to fire her. But she changes her mind, saying, "I soon realized that what at first seemed disrespect, if not MUTINY, was simply an uncontrollable outburst of temper." She tells Mrs. Dimmock about how disgusted she had been with the other housekeeper. Mrs. Dimmock is curious about the previous help and Mrs. Marrable goes on and on about Edna's "devotion to alcohol" and "foul mouth" among other things. This talk distresses Mrs. Dimmock but the old broad has something up her sleeve. She over spices the pheasant, giving it a bitter taste. Mrs. Marrable notices and says that George bought it at the market. The housekeeper implies that perhaps her nephew is trying to kill her for her money. "You are far too permissive with your fantasies. People don't go around murdering each other," Mrs. Marrable says. She adds that it takes a lot of courage to kill. Mrs. Dimmock says killing is just "nerve with a dash of cruelty." Mrs. Marrable loses her appetite and doesn't finish her meal. She calls one of the employee's references - not knowing that it's Mike she's talking to. He has nothing but nice things to say about Mrs. Dimmock...although he does mention her "Irish temper." Mike turns out to be Alice Dimmock's nephew. While Mrs. Marrable is away, he visits her and tells her he's worried for her safety. He says he's tired of all the blank postcards she's been sending him to reassure him she's okay. We find out the reason Mrs. Dimmock is there is because Miss Tinsley was a good friend of hers and she believes something has happened to her. When Mike tells her not to jump to conclusions, Aunt Alice tells him, "Mrs. Marrable's housekeepers seem to vanish...and you haven't heard her talk about the courage to kill." She asks him to do her a favor and go to the First National Bank in Phoenix and find out if Edna still has money in her savings account. She promises to leave soon after. Mrs. Marrable comes home earlier than expected, with a small statue that George bought her as a gift. Mike sneaks out but leaves his shoes behind. His aunt hides them under a desk and pretends to have been napping. At Edna's bank, Mike discovers there is only $32.83 in her account. He's told she made a withdrawal not too long ago of $9,000 in cash and that the last address they have on file for her is Mrs. Marrable's house. Under the guise of talking business, Mike has Julia take him to see Mrs. Marrable. Harriet sees them together and is jealous. Mike quietly slips his Aunt Alice the information and she promises to meet him the next morning. Mrs. Dimmock brings up the subject of money with her boss for the first time. She tells her she would like to invest her savings in stocks and Mrs. Marrable says she might talk to her broker. Their discussion is interrupted again by Chloe. Mrs. Marrable plans to take her housekeeper to an Indian Music Festival in New Mexico the next day. In order to phone Mike and tell him where they're going, Mrs. Dimmock lies and says she needs to buy a pair of stockings and toothpaste. While she's out, Mrs. Marrable discovers she was not out of the items. Mrs. Dimmock returns by the early evening and Mrs. Marrable has her write a note to a new groundskeeper, a person she calls "Al." Now she can match the handwriting to the earlier letter sent to Miss Tinsley and signed by Alice. Realizing that the woman in her employ is up to something, Mrs. Marrable becomes even nastier. Mrs. Dimmock tries to call Mike but he's out on his date. And Mrs. Marrable humiliates her by laughing out loud when she stops by her bedroom and sees the old white-haired woman combing out her red wig. In the middle of the night...and believing Mrs. Marrable is asleep...Mrs. Dimmock attempts to get in touch with her nephew again. Mrs. Marrable has been awake the entire time and accuses her of being too preoccupied with money. She calls Mrs. Dimmock a fraud and adds, "You come into my house in the guise of a faithful companion and you want to utterly destroy me." When Mrs. Dimmock mentions Edna, Mrs. Marrable asks her what their relationship was. The answer is that Edna was HER housekeeper and she was ready to come back to her because she was so frightened of Mrs. Marrable. "Where is she?" Mrs. Dimmock screams. Mrs. Dimmock then asks how many women she has killed - and Mrs. Marrable tells her she could have lasted a few years. "You expect me to be flattered?" is the feisty old woman's response. "YOU are a dead woman," Mrs. Marrable says...and a game of cat and mouse ensues. 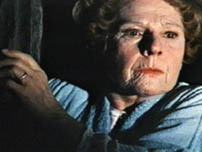 Mrs. Dimmock can't get out of the locked house and hides in a room holding a statue. She's frightened when Mrs. Marrable rolls her wheelchair towards her and she drops it. She then pushes the chair back towards her pursuer, knocking her to the floor. Finally, with Mrs. Marrable on the ground...Mrs. Dimmock picks up the statue and is about to strike, but alas - the poor woman doesn't quite have the courage. She turns around and attempts to call the police. Mrs. Marrable gets up off the floor and tries to strangle Mrs. Dimmock with the phone cord. She gets the upper hand by clobbering (!) the housekeeper with the receiver. Picking up the phone, she realizes it had been disconnected. "It was dead all the time," she cackles. In the morning, Harriet stops by to tell Mrs. Marrable that George has been trying to call her and overhears her "talking" to Mrs. Dimmock. With a witness, Mrs. Marrable puts the next phase of her plan into gear. She says that Mrs. Dimmock doesn't feel well - yet she insists on going into town to fill a prescription for her. When Harriet leaves, Mrs. Marrable puts on Alice's wig and drives off, as Harriet and Jim watch from the cottage. Mrs. Marrable drives towards a lake, with a weary and beaten Mrs. Dimmock crouched in the front seat. The fact that she isn't dead annoys Mrs. Marrable, who takes her purse and whacks her on the head. "I told" are the only words Mrs. Dimmock manages to say...before Mrs. Marrable leaps out of the car and it plunges into the lake. 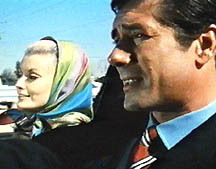 George arrives at his aunt's house with Julia, just as the telephone repair guy is there. Soon after, Mike stops by with Harriet. The first call that comes in after the phone is fixed is from the police telling Mrs. Marrable that Alice Dimmock was found dead. Mike is devastated and heads for town immediately to speak with the authorities. Saying she's distressed, Mrs. Marrable invites Harriet and Jim over to keep her company. Paranoid from Mrs. Dimmock's last comment...she drugs them and tries to find out how much information Harriet knows, to no avail. She even gives Jim her dead husband's briefcase, which contains his stamp collection. Mrs. Marrable accompanies them to the cottage, where they pass out. She then sets the house on fire, trapping the two of them - as well as Chloe the dog. 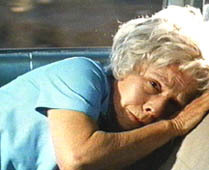 Mrs. Marrable goes back to her home, where she has a restful night's sleep. The next day, she hears a dog barking. She rushes to the window and is shocked to see that the pine trees in her garden have been dug up. Standing nearby are the sheriff, Mike, Harriet, Jim, George, Julia and Juan. Jim says the only reason they survived the fire is because Mike managed to rescue them. He presents Mrs. Marrable with the stamp collection she gave him. And now the twist: according to Mike, the stamps are worth over $100,000! Mrs. Marrable laughs tearfully. She says her husband must have hated her more than she hated him. She adds that perhaps she should apply for a domestic position in town. "I think I would make a most acceptable companion, don't you agree? I have savings of my own and I have no one left in the world. After all, I'd make a very handsome pine tree..."
Whatever Happened to Aunt Alice? stands as a solid cousin to Baby Jane. The direction by Lee H. Katzin is clean and assured. Cinematographer Joseph R. Biroc shot the film on location in Tuscon, Arizona and he perfectly captured the wonderful southwestern flavor. The pouncing score by Gerald Fried is terrific. Sometimes jazzy, often punctuated by organs and strings that make Bernard Hermann's PSYCHO music sound like a day a the beach - it's a perfect match for the on-screen histrionics. The review that appeared in The New York Times was mixed. 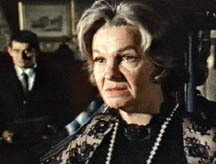 Vincent Canby didn't know what to make of Aunt Alice. 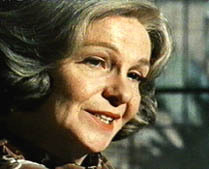 He wrote that Geraldine Page "touches everything with a sense of inspired madness." He was harsher on Ruth Gordon, calling her performance "busy" and noting that her red curly wig made her look like a "crazy animated peanut"! Our opinion? Page is formidable, scary, intimidating, a complete hoot...and exceptional as a monster. Gordon matches her every step of the way. 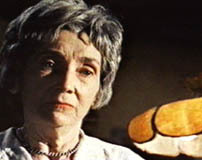 During her lifetime, Page was very well-regarded by her peers. 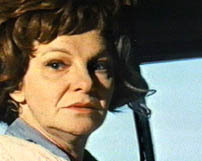 She received a staggering number of Academy Award nominations, before finally winning for 1985's The Trip to Bountiful. It was her eighth nomination. She passed away in 1987. 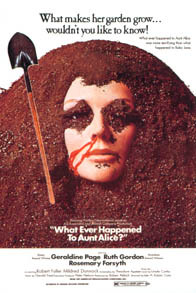 Whatever Happened to Aunt Alice? is truly a keeper sleeper.